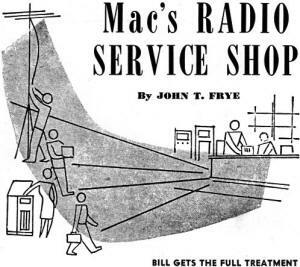 This is not the first time I have learned a new word when reading an episode of Mac's Radio Service Shop. "Calumny," is the word-du-jour for entry into my personal lexicon. It is not necessarily a technical word, but definitely one I shall attempt to incorporate in future writings. Calumny is "a misrepresentation intended to harm another's reputation" per Merriam-Webster. ...but I digress. A customer and fishing buddy of Mac's, each of whom is a small business owner, drops in at the repair shop to look for Christmas gifts for the family, but is evidently put off a bit by the prices. Mac turns it around on him by reminding him how most proprietors like them operate on small profit margins and rely on volume, and therefore long works hours to make a decent living. It is as true today as it was in 1949. Upon reading the entire article, it appears as though John Frye has his Roget's Thesaurus nearby while writing this piece. "Money-Mad! Money-mad! The man is money-mad!," Bill the barber commented sadly as he peered through the open door of the service department at Mac and his assistant, Barney, working away at the bench. "Money-mad my eye!" Mac retorted as he flipped off his soldering iron and kicked a stool across to his favorite fishing partner in a mute invitation to sit down. "In an honest business a man has to work six days a week to make a living. He cannot afford to take every Wednesday off and go around pestering other folks who don't have enough brass to ask eighty-five cents for ten minutes' worth of jockeying a pair of dull clippers around over a guy's noggin." "That is a base calumny - especially that part about the dull clippers - but inasmuch as this is the season of convivial good fellowship, I shall ignore it," Bill said a trifle smugly as he perched himself on the high stool and cradled one knee comfortably in the sling of his interlaced fingers. "However," he continued, "I should think you would be glad to see a customer enter your spider-web." "Did you say 'customer' ?" Mac asked incredulously. "Yes, I said 'customer,''' Bill mimicked with some asperity. "Money is not strictly a one-way proposition with me as it is with a certain Scotchman I know. This has been a fairly good year in the barber business - nothing colossal, mind you, in spite of your nasty innuendos, but a reasonably good year nevertheless. As a result, I thought I might sort of go all out for Christmas; and, in spite of the warning of my better judgment, I decided to drop around here first and see if you had any suggestions along the lines of making this an outstanding Christmas for the wife and the boy, Jim." "Battle stations, Miss Perkins!" Mac called through a megaphone of his cupped hands to the office girl. "Prepare to execute Operation Customer. First, bring a round of Cokes from the refrigerator, and see that you get an especially large and cold one for our very good friend and customer here, Mr. Besop." Barney, who was always more than ready to enter into any kind of horseplay, dashed into the furnace room and came back with an old shipping box filled with excelsior. "Here, Mr. Besop," he said as he knelt before the barber, "put your poor tired feet on this nice soft cushion." Bill looked in mock apprehension at the boy obsequiously flicking imaginary dust from his shoes, at Mac standing in front of him rubbing his hands together in an unpleasantly suggestive manner, and finally at Miss Perkins who had appeared in the doorway, smiling as she extended a bottle of Coke toward him. "Hey, what is this? Let me out of here! Quit looking at me that way!" he exclaimed, though reaching for the drink. "I feel just like a big fat worm that has fallen from a tree directly into a yard of hungry chickens." Mac stepped back and squinted at the barber critically through a frame formed by his fingers. "There is a striking resemblance, now that you mention it," he agreed; "although there are some who might argue that the appearance is more that of the leech." "Never mind them, Mr. Besop," Miss Perkins consoled. "I'll be glad to help you pick out something nice for your family, and I think I know the very thing for Martha." She disappeared momentarily into the front of the store and came back bearing a tray on which rested an automatic electric toaster and a gleaming electric coffee-maker. "I have often heard both you and Mr. McGregor say that you are likely to bite anyone who speaks to you before you have had breakfast," Miss Perkins explained; "but I suppose it never occurred to you men that taking a dim view of the start of a new day is not just a masculine trait. We women do not always awake just brimming with enthusiasm and good spirits either, but we still have to go ahead and set the machinery of everyday life to rolling again. "Anything that tends to make the launching of a new day as effortless and painless as possible is all to the good, and this pair of breakfast-aiders will do just that. With them to do the work, Martha will feel almost like a guest at the breakfast table." "Wrap them up and lay them away for me!" Bill ordered. "I never gave it a thought that Martha might be just as allergic to cold gray dawns as I am. If those doodads will help, she shall have them. But how about Jim? Got any ideas for him ?" "I think I have, Mr. Besop," Barney broke in excitedly. "You know what a hard time Mrs. Besop has in waking Jim up in the morning, especially if he has been out 'wolfing' until late the night before. Why don't you install one of our intercoms in your house with one substation right by his bed? Then, when Mrs. Besop wants to get him up, she can turn up the volume on the master station downstairs and practically blast him out of bed. "And then you can place another substation in the basement game room and another out in your shop in the garage. That way Mrs. Besop can call either of you when she wants you, no matter how much noise you are making. "Finally, I heard him say he wished he had one of our sensitive intercom outfits so that he and some of the gang could work out some ideas they have for a radio dramatic show. He figures that the game room could be used as a 'studio' while the 'audience' could listen in upstairs. That way they could tryout sound effects and everything. And -"
"Stop! you human gramaphone!" Bill shouted. "You have won your commission already, so stop twisting my arm. I was hoping you might know what Jim wanted. But how about you, you old Scotch sourpuss," he said to Mac; "don't you have any brilliant suggestions for separating me from my hard-earned cash ?" 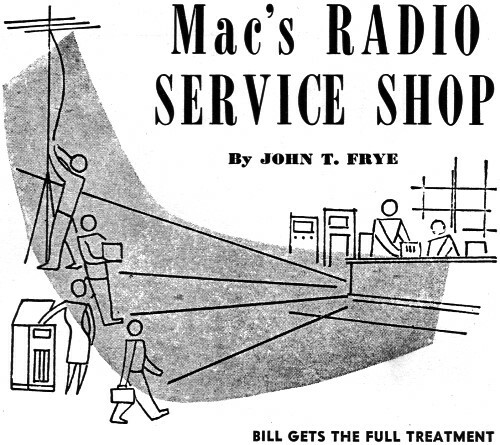 "I was just debating with myself whether I should let you buy the combination AM, FM, and TV radio, complete with a dual-speed record player, that is coming in next week," Mac said musingly. "Let me buy it! I'd like to see you make me. Why you are the very one who discouraged me from buying a straight television set when I wanted to do so a couple of months back. You said that in this ultra-fringe area reception was too erratic and spotty for me to get my money's worth out of a set at this time. Now you are talking about my buying a combination outfit that will cost twice as much!" "Just keep your shirt on, old scissor-bill," Mac said soothingly, "and I'll try to explain. First, you need a new radio and record player. That one you have now has served long and faithfully, and it is still in fair shape; but many improvements have been made in radios and record players since it was designed. Your whole family really enjoys good music, and I know that you would get a great deal of pleasure out of hearing the tone quality to be had from a modern top-quality combination radio and phonograph." "Then why don't I just buy me a radio-phono combination?" "Because TV is coming fast, and we are certain to have excellent reception here in a year or so. In the meantime, there are many nights when video reception here is very good, even with a comparatively simple two-bay antenna erected on the roof. If you had this combination, you would be in a position to enjoy the visual programs when they were coming through. 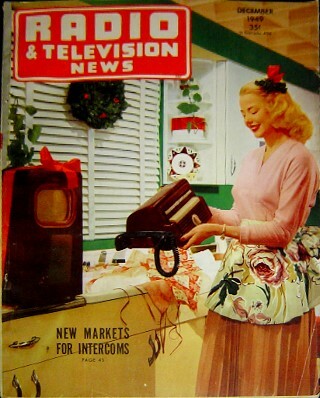 On the nights when they were not, your purchase would not be sitting idle, as would be the case with a straight TV set. You could still enjoy the fine AM or FM programs, or you could listen to your records. "In this way you would be in on the entertaining and exciting development of TV - something that you will miss if you wait until perfect reception is to be had here." "But isn't there danger that my set will quickly become obsolete?" "After watching the way the FCC has safeguarded the buying public in the past, I am quite willing to trust them to take care of this matter in the future." "By golly, I believe I'll buy it!" Bill said with sudden enthusiasm. "I know darned well I got more kick out of listening to Harry Snodgrass playing the piano at WOS on a three-tube blooper than I get out of all the programs I can hear today. The fun is in being in on the ground floor of something new, and that argument of yours about a combination being a better investment makes sense. Give me a ring when it comes in. Now I've got to go. Since you three have got all of my money, there's no use staying around here any longer." As he went out the door, he was whistling All I Want for Christmas Is My Two Front Teeth, but his face wore that self-satisfied look of a man who had completed his Christmas shopping early and satisfactorily.